After a more than 11 month hiatus, I've determined it high time to make my triumphant return to the world of recreational blogging. OK, so there hasn't exactly been a a clamoring for a new Frozen Ponderings post and I've never been what you would consider a regular on the blogging circuit. But after urging a friend to launch a blog I figured I'd give it another go and see what happens. It helps when a subject comes about that fires you up to a degree and this, of course, is no exception. Spurred by the euphoria of the free-agent signings of Zach Parise and Ryan Suter by the Minnesota Wild, nostalgic fans State of Hockey fans have since been pining for the Wild to ink another high-profile player to a contract: former Minnesota North Star, Mike Modano. Time to say goodbye for good, Mike. To be fair, Modano is responsible for instigating this lunacy with his July 4 tweet shortly after news broke about the Parise/Suter signings indicating what I interpreted to be facetious interest in returning to Minnesota to play for the Wild. Unfortunately, legions of fans took him seriously and Modano himself has only added fuel to the fire with additional comments in the media expressing interest in suiting up for Minnesota. Despite repeated reports from the StarTribune's Michael Russo, arguably the NHL's most plugged in beat writer, stating the team has no plans whatsoever to add the newly-named U.S. Hockey Hall-of-Famer, Wild fans continue to inundate Twitter and Wild-related blog comments with their insane quest to re-live their past. 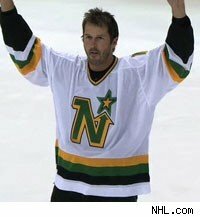 Modano is not, and should not, be in a Minnesota Wild uniform when the inevitable NHL lockout eventually comes to a merciful end. Modano's selection by Lou Nanne in the first-round of the 1988 NHL Entry Draft over Trevor Linden made "Sweet Lou from the Soo" two-for-three in making No. 1 overall picks (Bobby Smith 1978, Brian Lawton 1983) in his tenure as GM of the North Stars. Minnesota earned that pick with a 19-48-13 season in 1987-88 but, three seasons later, Modano helped lead the North Stars within two wins of a Stanley Cup before falling to Mario Lemieux and the Pittsburgh Penguins. I was a young North Stars fan at the time so I fully understand the impact Modano made in the green and gold before the team was hijacked by Satan's step-child, Norm Green, and relocated to Dallas in 1993. But although both Modano and I are 19 years older, apparently only one of us knows that it's too late to go back. Modano averaged .955 points per game in 1238 games over his first 17 seasons but his production slipped significantly (.731 ppg) in his last four seasons and 261 games. This includes .375 per game--15 points in 40 games--in Modano's final season with the Detroit Red Wings in 2010-11. Tack on an entire season sitting out and what does anyone seriously expect to get out of a 42 year-old Mike Modano? Even if he were slightly more productive, the Wild, as currently constructed, simply do not have room for him from either a roster or a payroll standpoint. In addition to Parise and Suter, the Wild also added Torrey Mitchell and center Zenon Konopka in free agency. Factoring in Minnesota's desire to have Mikael Granlund make the team as a center, Konopka's addition, along with Mikko Koivu and Kyle Brodziak, gives them six centers if you include Matt Cullen and Darrell Powe who will each have to play wing this season if they're on the roster. In my estimation this leaves Modano as, at best, the seventh option at center barring any sort of trade. However, I doubt any potential deals will have any effect on the center position and there are too many young prospects vying for spots to consider Modano for anywhere else. Considering the Wild already have 12 forwards signed to one-way deals and Granlund on his entry-level contract, Minnesota GM Chuck Fletcher will have some decisions to make regardless so Modano is far from Fletcher's radar. There's also the matter of less than $800,000 in cap space which is over $200,000 less than Modano made in his lone season in Detroit. Is Mike Modano the Wild's best option for a fourth-line wing? Uhhh ... yeah ... I don't think so either. Quite honestly, I would find it pretty damn sad. Modano needs to do everyone a favor and put an end to this nonsense once and for all. In the meantime, the delusional among the Wild's fan base must seek to get a firm grasp on reality and focus their attention on what appears to be a brighter future for their favorite hockey club. Where was this guy 5-6 years ago? Perhaps he plays goal? We need many backups.